Home > Events & Initiatives > Go Higher! 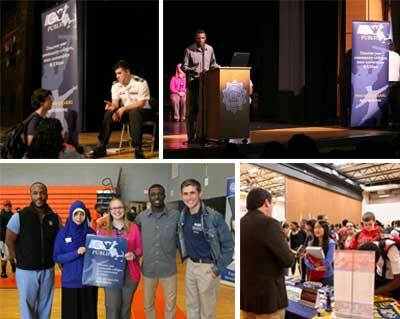 For more photos, visit the GEAR UP Massachusetts Facebook page and the Department of Higher Education Flickr page. Go Higher! is a campaign organized by the Massachusetts Department of Higher Education in partnership with GEAR UP and Massachusetts' 29 public colleges and universities. It features events at local high schools that educate students about public higher education options in the Commonwealth. Each event includes student speakers who tell of their experience attending a community college, state university or UMass campus. Campuses bring interactive exhibits, and admissions officers are on site at each event to answer questions about choosing a major, navigating campus life, and getting financial aid. Go Higher! works with GEAR UP to inform students of the opportunities awaiting them at Massachusetts' public colleges and universities, and promote a college-going culture in low income school distrcits.